This is a well done book that you can carry with you while you search for hockey dwellings in New York City. I love that Lasker Rink is on the top of the list. A hockey rink in Central Park is great but when NHL teams practice on it, that’s when it raises the interest. This tome covers all types of hockey including roller and street hockey. There are some great hockey luminaries mentioned here. On page 115 there’s a section on Bill Torrey. It’s a great tribute to the late, great, hockey GM. I love the food section. You can never go wrong suggesting eateries and bars. 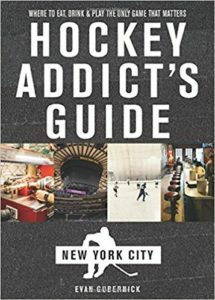 This book is great for a tourist, a hockey fan, or a hockey fan in New York that thinks he or she has been everywhere. Evan Gubernick did a great job on this and the Countryman Press has a winner here. The only negative is the small type. I can read it without any glasses but any smaller and it would be tough.